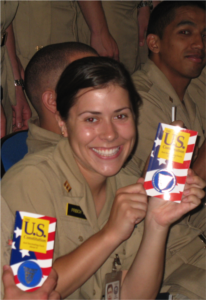 At a class officers meeting a year after of 9/11, Captain (ret.) 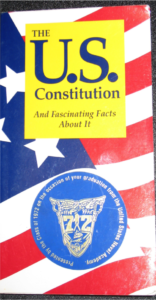 Tal Manvel suggested that the class give a copy of the U.S. Constitution and its vision, the Declaration of Independence, to each graduate during Commissioning Week. A sticker with our class seal is attached to each copy that says the following: Presented by the Class of 1972 on the occasion of your graduation from the U.S. Naval Academy. Starting in 2003 members of our class have passed out this booklet, first at the beginning of the rehearsal for indoor graduation, and since 2011 as part of the ceremony where the graduating class unveils its class seal in Alumni Hall. So our gift giving is now a part of Commissioning Week. As of 2016, we have passed out over 14,000 copies. The booklets are published by Oak Hill Publishing of Naperville, Illinois. We hope to continue this tradition for years to come, and pass it off to a later class before we are gone. 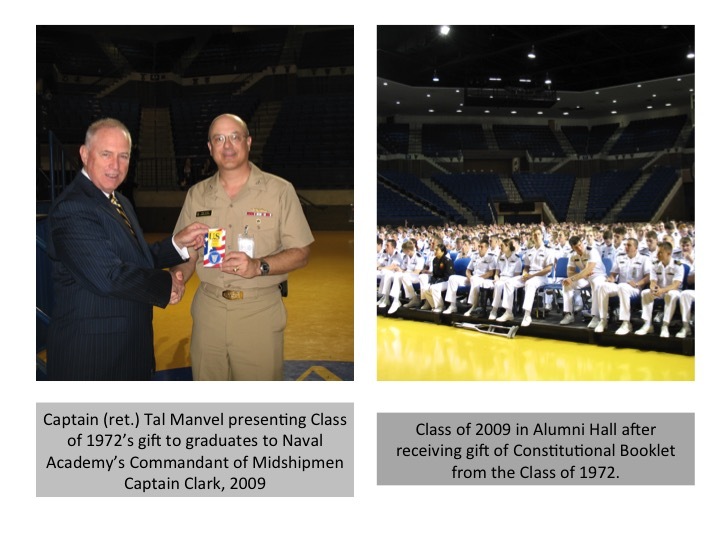 If you know of a Naval Academy class that might be interested, please contact Tal Manvel @ talmanvel@icloud.com. At the end of the graduation ceremony, the Chief of Naval Operations or the Commandant of the Marine Corps will rise to have you rise to take an oath to defend not a king nor a kingdom, nor some motherland or fatherland home to some racially superior or mystically chosen people. No, we are a land of many races, many religions. They will lead you in taking an oath to defend a body of ideas and ideals that are the Constitution of the United States. On behalf of the class of 1972, it is our honor to provide you with a copy of that great document and its vision, the Declaration of Independence. Keep them close with you throughout your career. Read them. Read about them. Come to understand their greatness. If you do you may come to the same conclusion that other Americans have; that this is a body of ideas and ideals not only worth fighting and dying for, but more importantly, worth dedicating your life to in defense of, when like those other Americans before you, you pledge your lives, your fortunes and your sacred honor. Class of 20__, the Class of 1972 salutes you for this commitment. Thank you. Good luck.